Hung with a magnificent whooping 96.62 carats Vivid Yellow Diamond this brooch has a pre-sale estimate of USD 8 Million! This magnificent brooch has an equally enchanting history. In 1971, Van Cleef & Arpels acquired this 96.62 carats vivid yellow diamond briolette. It was commissioned a year later by an important American collector, & a Bird of Paradise was crafted in yellow gold set with yellow diamonds, white diamonds, emeralds & a blue sapphire cabochon. It was crafted to be detachable. The yellow diamond briolette can be detached & worn as a separate pendant, while the wings can be detached & worn as a pair of earrings & the tail can be worn as a separate brooch. Ganna Walska (1887-1984) was a Polish-born Opera & Concert-singer, was also a famous international socialite. In 1971, 13 years before she breathed her last, she sold of a major portion of her magnificent jewelry collection to finance the addition of a garden to her Lotusland, where she had been living for over 40 years! & the sale of this Fancy Vivid Yellow Diamond Briolette was a major contributor to the finance! The Walska Briolette Vivid Yellow Diamond Brooch was auctioned for over $10 Million, 2 million dollars higher than the estimated value! History of the Brooch. In 1971, Van Cleef & Arpels purchased the fancy vivid yellow briolette diamond at a Sotheby’s New York auction of the Collection of the Jewels of Madame Ganna Walska. 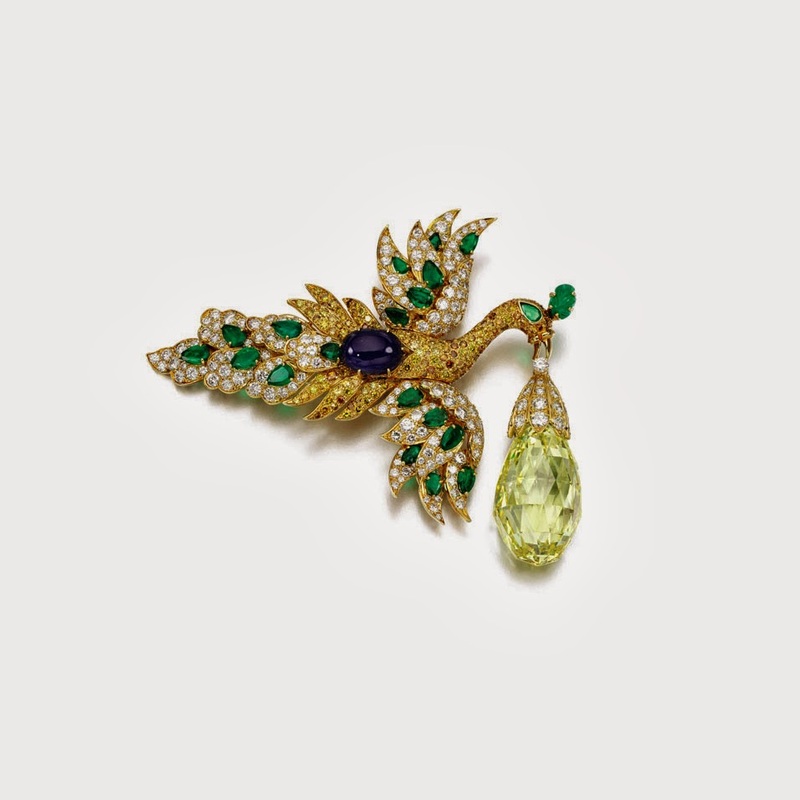 Commissioned a year later by an important American collector, the Maison created a transformational piece as a setting for the “Walska Diamond”, a Bird of Paradise in yellow gold set with yellow and white diamonds, emeralds and a cabochon sapphire. The 96.62-carat diamond, suspended from the bird’s beak, can be detached and worn as a pendant, while the bird’s wings also detach to form a pair of earrings and the tail can be transformed into a brooch. Ganna Walska. Ganna Walska (1887-1984), the Polish-born opera and concert singer, was a famous international socialite. She married six times and over the course of her lifetime acquired an amazing collection of jewels and fine gemstones. In 1971, she took the decision to sell her jewellery collection, including the briolette diamond, at Sotheby’s to finance the addition of a cycad garden to Lotusland, the magnificent garden near Santa Barbara, California she created and lived in over 40 years. H the Brooch. In 1971, Van Cleef & Arpels purchased the fancy vivid yellow briolette diamond at a Sotheby’s New York auction of the Collection of the Jewels of Madame Ganna Walska. Commissioned a year later by an important American collector, the Maison created a transformational piece as a setting for the “Walska Diamond”, a Bird of Paradise in yellow gold set with yellow and white diamonds, emeralds and a cabochon sapphire. The 96.62-carat diamond, suspended from the bird’s beak, can be detached and worn as a pendant, while the bird’s wings also detach to form a pair of earrings and the tail can be transformed into a brooch. Ganna Walska. Ganna Walska (1887-1984), the Polish-born opera and concert singer, was a famous international socialite. She married six times and over the course of her lifetime acquired an amazing collection of jewels and fine gemstones. In 1971, she took the decision to sell her jewellery collection, including the briolette diamond, at Sotheby’s to finance the addition of a cycad garden to Lotusland, the magnificent garden near Santa Barbara, California she created and lived in over 40 years.